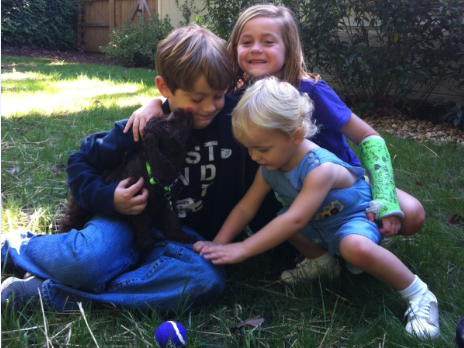 Testimonials From Our Customer Who Experienced An Adoption They Will Never Forget! 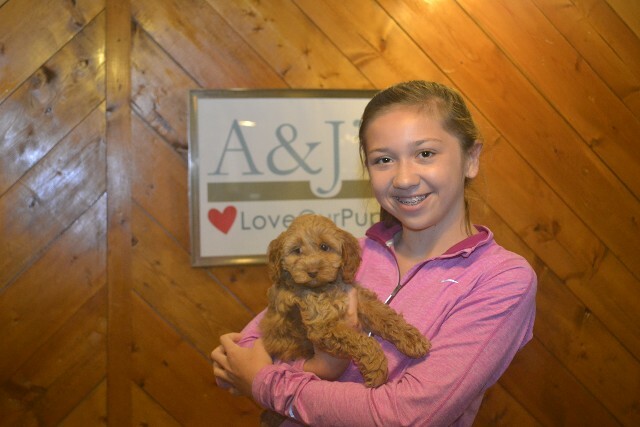 At A&J’s, We Love Our Pups and hope you will too! Also, we thank all of our previous customers for their comments. I wanted to update you on Chance who is now a year old! I can’t believe it’s almost been a year since he came into my life! He is such a wonderful, sweet, friendly and intelligent dog. We constantly get stopped by people who wants to play with him, everyone loves the color of his coat and how soft it is. Also, how much he looks like a Teddy bear, he’s my little shadow, he’s right beside me no matter where I go! It took me two years trying to research breeder, and I’m so happy I chose A&J’s LoveOurPups! Thank you for allowing me to adopt this wonderful puppy! Ginger is now 13 months old. Can you believe it? She doing great and was spayed around six months ago. She is currently holding her weight around 15 pounds of fluffy energy. 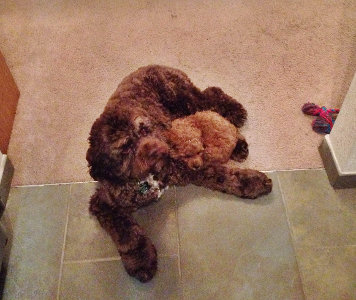 Ginger and our new baby boy (8 months now) are the best of besties and is still my older kid’s baby. I’m so glad we ran across your website! I wanted to let you know that Piper is now an international pup. We are currently living in London, UK and she’s enjoying herself. She even has a boyfriend already! His name is Duchy and he’s a King Charles spaniel. Piper did great on the flight over and thanks to our vet and pet relocation specialist, she was prepared to enter the country right away and spent no time in quarantine. Our local London vet is working on a pet passport for her so that we can hopefully take her on some of our travels to other countries! She misses her 1/2 sister Shea, but we’ll see her again when we return to the states possibly in 3-5 years. 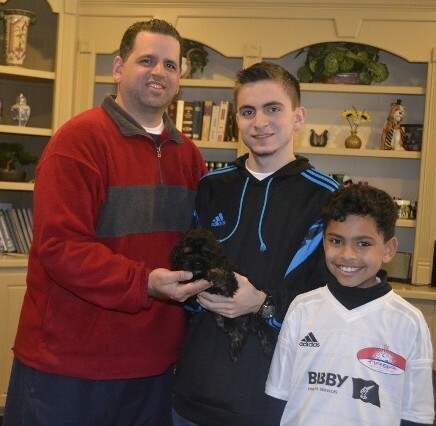 We had a wonderful experience with A&J’s LoveOurPups. The staff was extremely professional and kept us updated throughout the process. The area in which the puppies were kept was clean and pleasant. You could tell they received a lot of love! We are grateful to this team for helping us complete our family with Georgia! Our little Maggie is doing great! She is healthy, very playful, and very loving! She is going through all the expected normal puppy play and integrating into our home with us and our other dog and two cats. We had an awesome experience with AJsLoveOurPups! The communication through the entire process was great! The care package we came home with got us off to a great start with our new baby. We appreciated your care of Maggie until she could come home with us. It was very evident that she was in a clean and caring environment. Based on our fantastic experience throughout the entire process, I high recommend AJsLoveOurPups to anyone looking to bring a new puppy into their home! 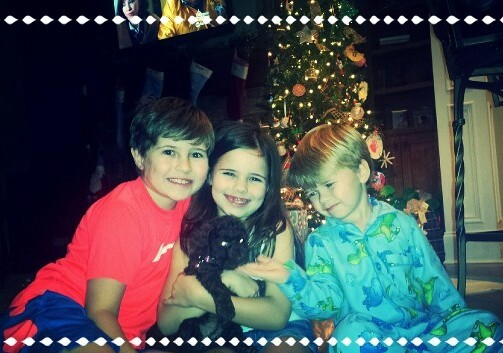 Gracie has captured our hearts. Its very obvious that her first 8 weeks with her litter mates and A&J's LoveOurPups staff had such a positive affect on Gracie's early socialization. She has bonded so well with us and is so sweet and friendly with our friends and family. We could have used a breeder much closer to us but after reading your website we decided whats a few more miles to be ensured a quality pup. We were most impressed by knowing that puppies were not shipped. This proved to us that Jamie cared more about the puppy's well being than the ability to sell a few more puppy's. Thank you so much! We are so in love with our new family member. Fred has had a wonderful first few days in our home and he is already showing quite the personality. He is truly the best and we can't thank you enough. I will be back in touch in a few days with some additional feedback, but in the meantime our experience was absolutely perfect. Thanks so much for reaching out. Wrigley is doing so well and we love her so much! 1. We were both very impressed with your presentation. Immediately upon meeting you, your uniforms with your brand logo made it apparent to us that you were a professional. Throughout the process, you demonstrated that many times. Specifically, we appreciated that the puppies were kept inside your home like members of the family, and the puppy care baskets that you sent us home with. 2. As with many on-line purchases, we felt some anxiety especially because we were making an investment into a dog that will be with us hopefully for the next decade or so. We chose you as the breeder because of your many testimonials and your dedication to the AKC and CKC brands. Upon meeting you, all of our anxiety disappeared. We enjoyed the tour of your home and detailed explanation about the breeding process and were much more at ease when we left after meeting Wrigley. 3. We would recommend you to any of our friends or family looking for this breed of dog. I truly believe that you are an excellent breeder. 4. We were most impressed with your attention to detail and dedication to the dogs. We are both very detail oriented ourselves, and felt that you left no stone unturned throughout the process. From the certifications and paperwork of the parent dogs to the veterinarian that cared for the dogs you were very much showed that you knew what you were doing. We could see that you also enjoyed what you did, and that the dogs were not just a business to you. 5. I have had experiences with other breeders throughout my childhood and through my family members. My family has always had purebred shetland sheepdogs and my mother has flown all over the country to find the right breeder for our dogs. 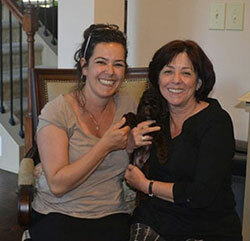 She helped to advise us through this process, and was impressed by your services. Overall, I think the pricing of the dogs was very fair. As a reference, my brother just paid over $2000 for a purebred golden retriever from a breeder located in upstate New York. Frankly, from what we experienced with you, we thought your prices could have been higher than what you charged because you were so good. 6. We were impressed by how the dogs we housed. We loved that the dogs were indoors and had a dedicated spot within your home and were impressed at how pristine your facilities were. 7. We thought your customer service was great and liked that you were always available by phone. 8. Your website presentation matched your in person and were impressed by both. 9. Our overall experience was fantastic. Our expectations were met and far exceeded. Again, we would not hesitate to recommend you to a friend or family or to adopt another dog from you in the future. Thank you so much for everything! 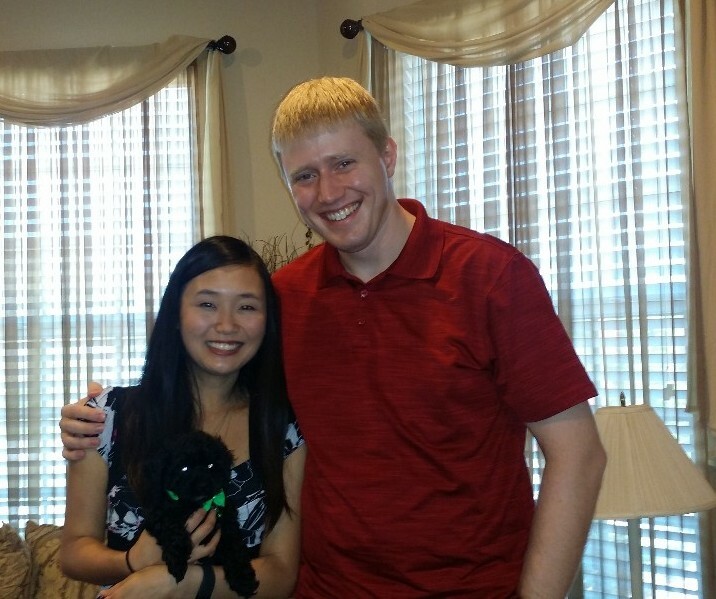 My name is David Sharpe - my fiancee Daimeng and I bought our puppy, Astro, from you and picked him up around the middle of August. Astro is an energetic little ball of love and is also quite intelligent. We're incredibly happy to have him and glad we got to work with folks as wonderful as y'all. Bennett is doing great! He never cried since we left your driveway. He sleeps all night, he knows his name, he knows "sit", "up", "come", "outside" and Funny thing is that, my family is in town and their 8 year old dog doesn't know commands like my 9 week puppy. They are jealous!! 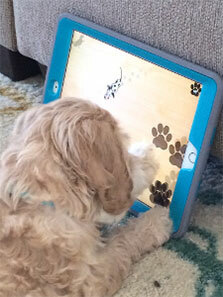 He plays games on the iPad too. 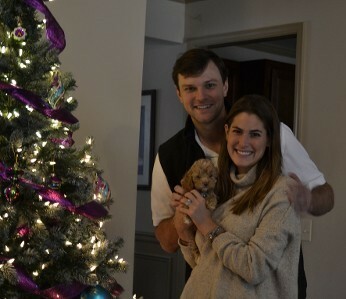 Shannon and I have been meaning to write to say how unbelievably happy we are our P E R F E C T puppy Brooks! He is the highly of our life and joy he's given us! We never dreamed we could be so blessed! Everyone who comes in contact with him sees the sweet disposition he has! Thank you, thank you, thank you! Several people have asked me for name and are very interested! Don't be surprised when you get the call?. We also have some beautiful pictures of Brooks I want to forward to you. Please let me know where to send them! Hope you had a great 4th! Love to you and all your pups! Just wanted to let you know that our little Roosevelt traveled very well during the seven hour drive. He never whined and only whimpered once to let us know he needed to use the bathroom. He used the puppy pad great! He has adjusted nicely to his new home and yard! We are so thrilled about our new family member! Thank you so much for all of the texts and pictures along the way! Happy Holidays to you and your family! This is the paperwork for Frankie's neutering. We just love him he is such a good dog. He has really made himself at home here in RI hopefully he will enjoy the winter months up here in New England !!! We are so glad we found him on your website he has been a Godsend to us all !!!! He gets along with his other cousin dogs just great !!! 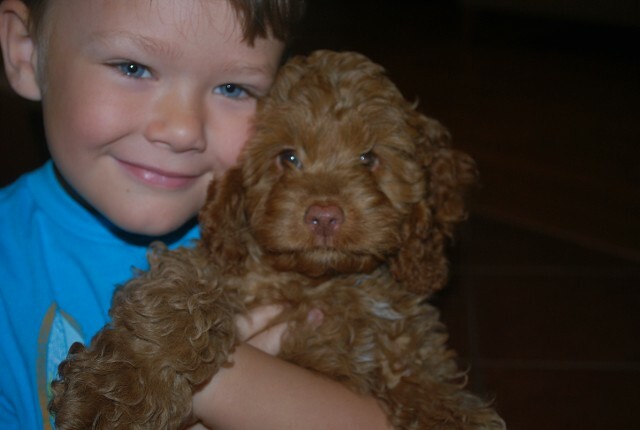 When I decided I wanted a cockapoo for my next dog I did a lot of research on breeders. I'm from Pennsylvania - near Pittsburgh. I couldn't find a puppy nearby (I wanted to get one while the weather is still nice). 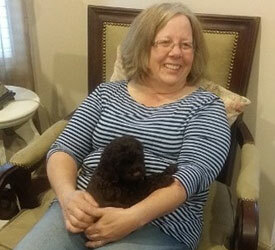 I contacted Jamie and must say that every aspect of getting Charley was a pleasant and positive experience. She was very accommodating being that I was traveling so far to get him. When I arrived at the house to get Charley I was greeted in a very friendly way. When I met Charley it was love at first sight - both ways. He was as happy to meet me as I was to meet him. I was given a tour of the facility and met all the parent dogs. The place was very clean and well kept. Charley and I spent our first night together in a pet friendly hotel. It was a very smooth transition for him. No whining and crying all night. His flight to Pittsburgh as my carry on luggage went very well and now that he's in his new home, he and I are as happy as can be. 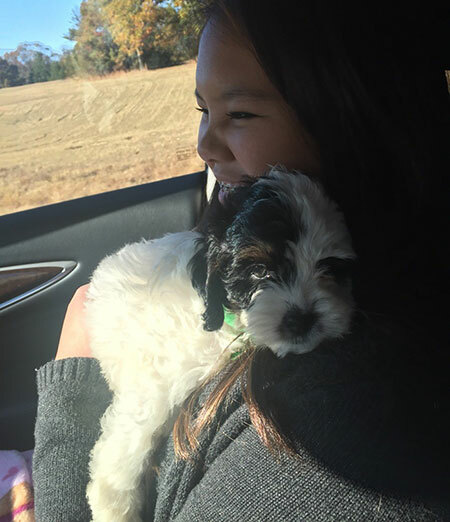 I would recommend AJSLoveOurPups to anyone looking for a cockapoo puppy. They truly do love and care about their pups... Even after the sale. Jamie checked on Charley after I'd gotten home. 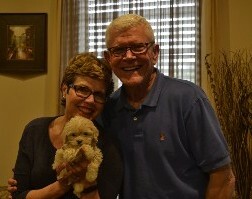 I look forward to many years with Charley, the new addition to our family! We wanted to let you know that Mae is doing great and also wanted to say that we are so impressed with your business!! Mae is a sweet, playful and smart pup. She loves to play, cuddle and is very friendly when meeting new people. She has transitioned very well into her new family. We were very impressed with A&J's professional looking website. Jamie always answered any questions through texts or calls in a timely fashion. Since we live far away, we had family that live in Jamie's area help with the process of purchasing Mae. My family stated that Jamie kept an immaculate home for the puppies. Jamie was wonderful dealing with our long distance situation. Thank you for our newest family member! We adore her! 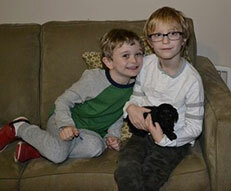 There are not enough words to describe our wonderful journey with A&J's LoveOurPups! 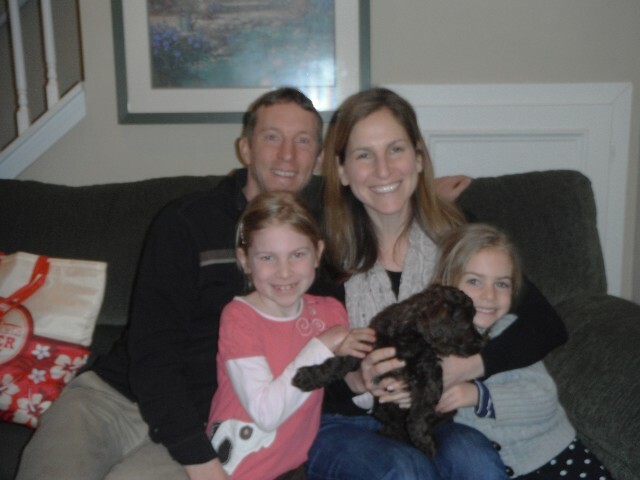 My family and I were searching for a Cockapoo and not only did we find our sweet, wonderful and precious Oliver, we feel as though Jamie and Andrew will be our lifelong friends!!! I had numerous questions at the beginning of this process and not once was I made to feel as though I was being bothersome. Jamie answered not only all of my questions promptly, but even gave advice along the way. I felt so comfortable knowing how well each and every dog was raised, treated and trained and we immediately could see that in Oliver!!! I was nervous and excited to meet Oliver for the first time, but they made the transition so warm and genuine which in turn made our first moments ones that I will continue to cherish! I will forever be grateful and appreciative of such a positive experience for the beginning of this exciting time in our lives! Thank you for such a gift! This little guy is settling in really well! I have decided to name him Samson. He is such a sweetie and very smart! He is already picking up on certain commands and is just a joy to have. We went to the vet yesterday and she said he is a happy healthy pup. We will be going back in a few weeks for his boosters and he did so well at the visit. Needless to say everyone adored how precious he is. He slept through the night last night and has learned his crate is a fun rewarding place to be. He runs and jumps in there with his momma blanket you gave him and it's so cute!! Thank you for taking such great care of him and making sure he is socialized at an early age. I love him so much already and I couldn't have asked for a more perfect pup. Our experience with Duma and A&J's Love Our Pups has been very positive and exciting. Both online and personal presentation were both very professional. Ms.Williams answered all our questions and concerns about purchasing our new puppy. She always made herself available by phone and via text making the purchasing process easier. 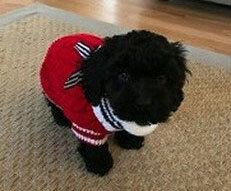 Prior to doing much research on the cockapoo and cockapoo breeders, it was evident that A&J's Loves Our Pups was the right decision based on all the reliable information and sources on the website. We were very impressed by the folder that was given to us the day we picked up our puppy that contained all the vet information, contract, puppy care packets and brochures, and many other informative sources. We were impressed by the overall environment that the dogs and puppies were kept in. The facility was very clean and climate controlled. 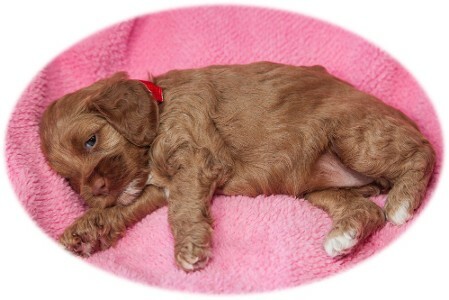 We will recommend A&J's to everyone that has any interest in buying a cockapoo! I just wanted to thank you again for my sweet pup, I am already so in love with her! Hazel has adjusted very well to her new home... she has not whined once in her crate at night -- thank you so much for beginning crate training! She is a good eater and quickly transitioned from puppy pads to going outside with minimal accidents. She is so playful and eager to learn! But my favorite thing is how she is a big snuggler... she has to be near me constantly! I just felt SO good about getting my new furry family member from you and your family. I could tell that your home was a loving and caring place for these puppies to get their start. I love that I got to meet Hazel's parents and littermates! From high quality food, to vet visits, to early socialization -- It is obvious that you pride yourself on providing the very best for your dogs and their "furever" families. Thanks for a wonderful experience and a sweet new best friend. Leo is adjusting well to his new home. He is very playful and a good boy. 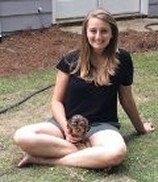 You did a great job in beginning the socialization process as well as crate training and potty training. He is friendly with everyone, has only had a few potty accidents and whines for only a few minutes before settling down when put in his crate. He also sleeps through the night, thanks for the mommy blanket. At first I would wake up in the middle of the night to take him out, but he seems to have no problem sleeping through the night ( I am still cautious though). He is also very smart and learns quickly. I attribute this to your quality parent dogs, who were also adorable. You have a beautiful home and yard for your furry friends to enjoy and I can tell that they are well cared for and happy. It was a pleasure to meet you and your daughter. I would highly recommend you as a breeder and a wonderful person! Just thought I'd share a pic of Leo for his second birthday. He is a darling and wonderful "little man" now. 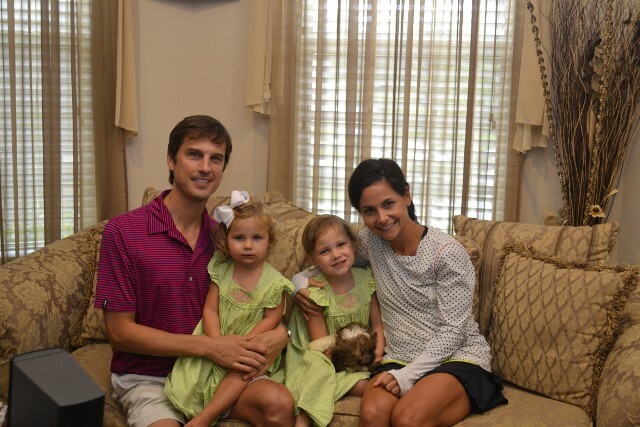 We wanted to submit a few comments about our wonderful experience with Jamie and her family. We recently brought home our new family member we named Frank. He is a great addition to our family. 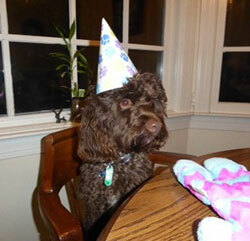 Frank came to us perfectly healthy and blended with our family from day one. 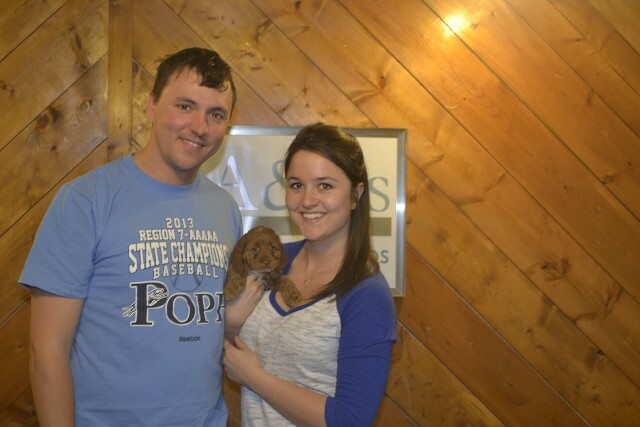 The experience with A&J's We Love Our Pups was exceptional in every aspect. From the very beginning Jamie kept us up to date on our pup's progress with texts and photos and was always there when we had questions. We can't say enough about the whole experience. If and when we decide to adopt another puppy we will undoubtedly return to A&J's We Love Our Pups. Thank you so much for the wonderful addition to our family. Our little puppy has already brought so much joy to our home in only one week. 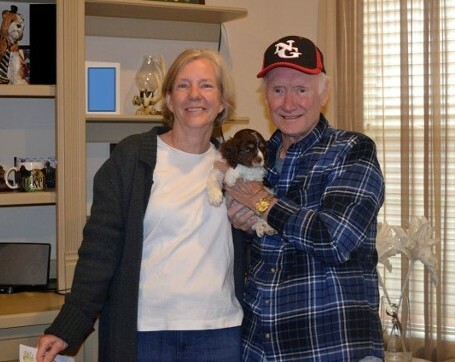 This was our first time working with a breeder and loved that you had a wonderful reputation as a Georgia State Licensed breeder. Everything about our experience was wonderful. 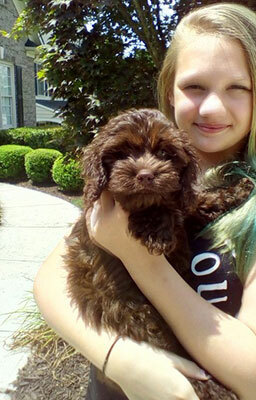 We found the payment process was very easy and making an appointment to choose our puppy very well organized as well. What we were most impressed with was the cleanliness of the facilities and the health of the parent dogs. As previous dog owners, we know how important their environment is to overall well being. After looking at a few other breeders, we knew that A&Js was the place for us. The others didn't even compare to the facilities at A&Js. The dogs looked happy and healthy. In addition to the great health and well being of the dogs and the clean environment, we found that the customer service was top notch. We received pictures of our new puppy as she grew, updates on her vet visits, and a complete puppy packet on how to care for our new addition. 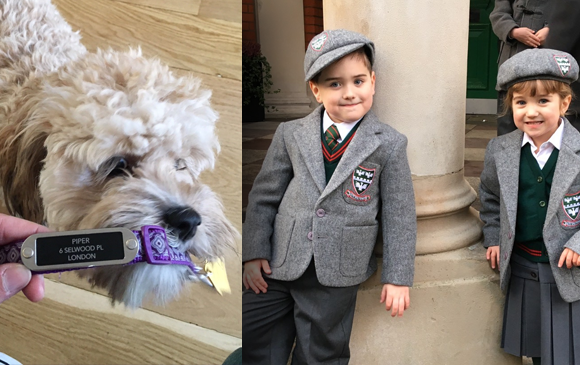 Working with A&Js was the most wonderful experience and we will definitely recommend them to our friends and family looking for a great Cockapoo to join their family. We LOVED our experience with you! The pictures of your dogs online definitely don't give them the justice that they deserve. They are so beautiful and well groomed. They have the prettiest, softest coats! One of my favorite things is that we got to come visit him so many times before we were able to take him home. I feel like it really helped him bond with us and know who we were before we picked him up to take him home. Schrute is transitioning so well in his new home! The first thing he did when we got home was go to his kennel and nap for an hour and a half. While I was slightly disappointed that he didn't instantly want to play with me, it created an immediate comfort and security for him in the kennel. He has slept all through the night every night since we picked him up and never wines unless he needs to be let out to use the bathroom. It is especially great with our schedules since we both work full-time jobs and he has to be kennel for a lot of the day. I am able to come home for lunches and play and let him out, but he has not had one bathroom accident while in the kennel! There are normal puppy challenges, such as chewing and just general adjusting to life with a little fury baby who wants your constant attention, but he will grow out of those things. We LOVE him so much and are so glad we used A&J's! You were very easy to work with and great about sending picture updates on his progress and growth. I would, and will, highly recommend you to my friends and family! This is our second time buying from Jamie, so we obviously enjoyed our experience with her! The dogs are healthy and playful. They both have such friendly temperaments and adjusted to our home so quickly. When we decided to get another furry we didn't even look around for other breeders, we knew we could trust and be confident in the kind of dog we would get from A&J's. I would highly recommend buying from them! Puppy - Mocha is doing WONDERFUL! We are in love! The experience was great. Our family is in love with Ladybelle. Thank you so much for the follow up email with the picture. We were so impressed with the whole process of getting our puppy. Your facilities and your home are so nice. 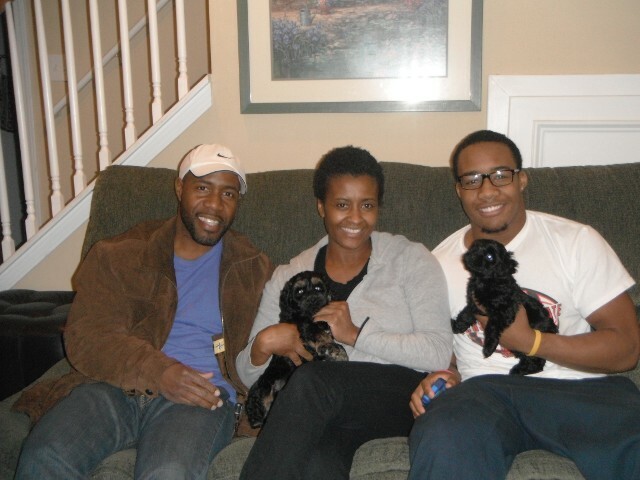 It was great getting to meet our puppy's mommy and daddy. We especially liked you sending home the transition blanket and the great information on potty training and crate training. We would highly recommend A&J's to anyone looking for a puppy! Thanks again. My husband and I can not stop talking about how wonderful this whole process has been. We are first time pet owners and were very nervous. I have been researching for 2 years and found you, what a blessing! The pricing was perfect all the other breeders were twice as much plus most charged extra for the shipping. We were thrilled that we could drive to you and you also allowed us to visit Ella when she was about 4 weeks, so beautiful. 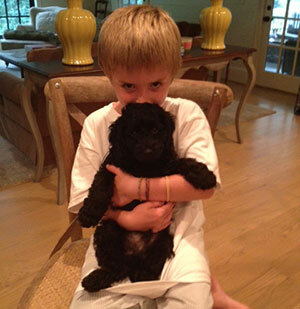 My son couldn’t believe it, when we arrived at your home, that we actually were going to have a puppy! I want to say Thank you so much for a wonderful little girl! She is so sweet and most important so smart. She slept in her crate all night the first night we brought her home, Amazing! The transition blanket was wonderful, that you recommended for us. She already does great with potty training as well, no accidents in the crate, again amazing! We have friends with dogs and have been told so much information. We were overwhelmed, however, you have made this a breeze. Even the vet was impressed, she said we are very lucky to have such a good puppy! You have also been wonderful getting back to me with any questions we have, this has helped tremendously being first timers. We are truly blessed that you came into our lives to give us Ella Thank you from the bottom our hearts!! I cannot tell you how in love we are with our new family member, Fuego. He is so smart and so loving and the perfect addition to our family. 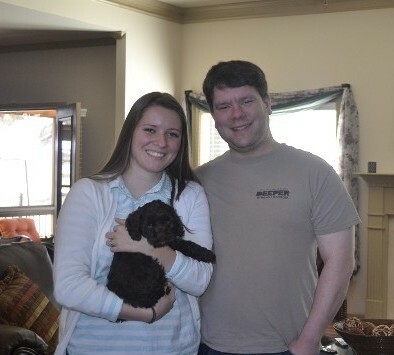 Admittedly I was very nervous about bringing a new puppy home… Worried about sleepless nights, potty mistakes, etc. Needless to say, he has exceeded all of my expectations! Crate training has been so easy and he has been sleeping through the night for two weeks! My kids, my husband and I are all in love. Thank you so much for giving us so much joy! 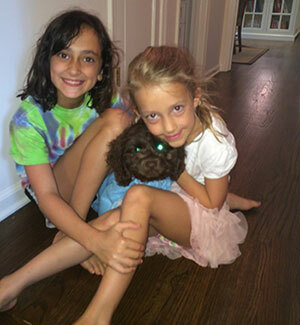 We love our new cockapoo named Hazel – aka Hazey Bear! She is absolutely gorgeous with unusual blue/green eyes. After tons of research we determined that AJs Love Our Pups is first-rate for cockapoos. Jamie has been a blessing to deal with. She obviously loves her puppies and they are being raised in a very clean, calm environment. I believe that’s why our Hazel is so calm and sweet. She is also very smart, especially when it comes to potty training. 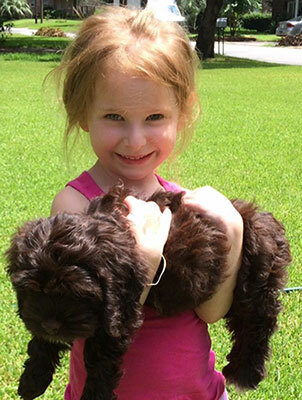 Jamie already had her using potty pads and going outside so Hazel is really doing great! 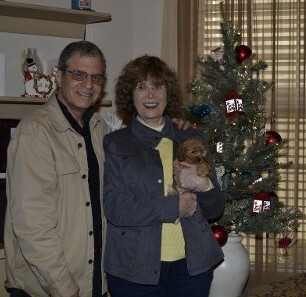 Thanks Jamie for our new puppy – she is adorable and we already love her so much. 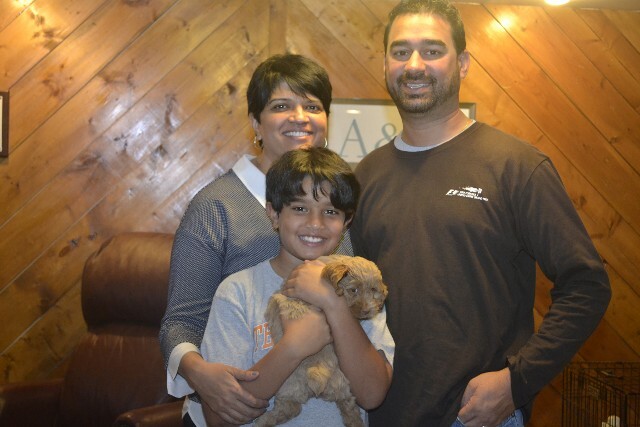 "As new dog owners, we consider ourselves blessed to have had A&J's guide us through the process. They went above and beyond to make our journey a pleasant experience. 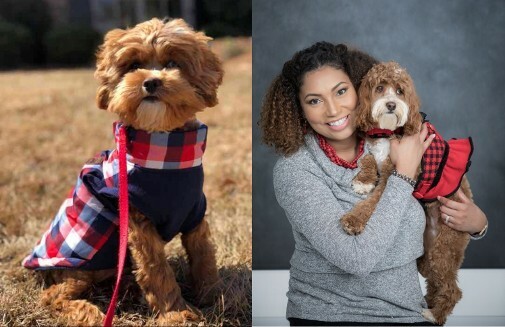 From the moment we inquired about a puppy until the day we met Bentley, A&J's has been professional, nurturing, and willing to provide anything necessary to make Bentley's transition into our home smooth. 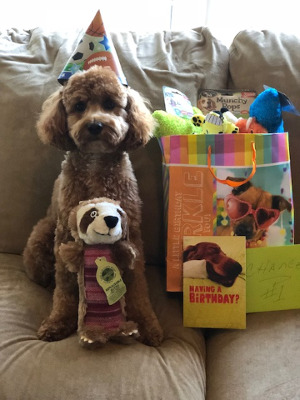 He has been nothing but JOY since he arrived and we are thankful to Jamie and her staff for properly preparing him to become a member of our family." A&J’s exceeded our expectations! We had the absolute best experience we could ask for. When the puppies were 3 weeks old, we had the difficult decision of choosing a puppy from the litter. They were all so sweet and perfect but we fell in love with our little boy Talbott and knew he was the one. About 5 weeks later, we brought him home! We were sent home with everything we needed. The entire packet of information, a transition clothe that had been put with Talbott's mommy and even some potty pads and food made the transition easier. A&J’s thought of everything! We are so in love with our little boy! He brings us so much joy! Thank you A&J’s!!! This was our first experience with a breeder and we spent a lot of time finding the best one! My fear was buying from a breeder with too many animals to be able to treat them as part of their family. A&J's was a small, responsible breeder with a very loving environment, exactly what we were looking for. Arya has the cutest personality, very playful and very smart. She loves all the attention and affection we can give her. So excited to raise our little pup! Thanks for everything, Jamie. We are very happy with the entire process of purchasing our little pup from your litter. You made everything clear and answered all my questions in a timely manner which just doesn't happen these days. Our little "Joey" has been a true pleasure. I was so impressed with the environment you have for your dogs. They have their own little suite downstairs and are obviously very happy there. Joey had very little anxiety the first night. He only made noises when he needed to go potty and he's been using the little patio potty I purchased perfectly! This puppy is so smart he seemed to know exactly what I wanted him to do when I took him out there to go potty. As soon as we picked him up from you he was relaxed with us. I've seen several puppies just get so nervous and shaky around people but your puppies have been well socialized. I also liked that none of the dogs barked when we first arrived! It was very welcoming. We have gotten so many compliments on how Joey is adorable, smart and mild mannered. Our expectations have been exceeded thus far! Thanks for everything...we are very pleased! Thank you so much for CoCoa! She is in her new loving home. She is just doing amazing and potty training great too. We are all smitten by her. Our little Piper is doing well! She is a sweet, perky little pup and growing so fast! She loves my two boys and they love her to pieces. 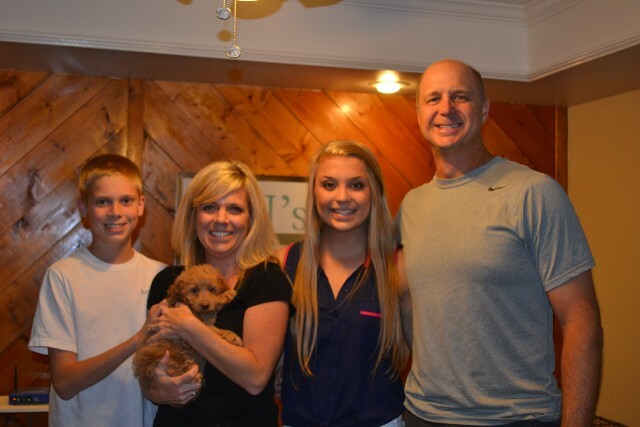 We are so happy to have Piper as a part of our family. 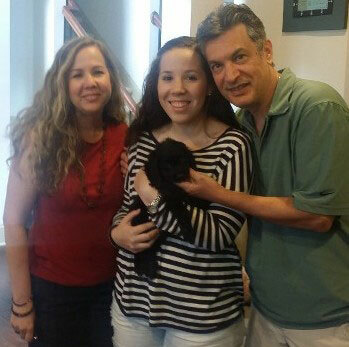 The whole process of picking out our pup and bringing her home was smooth and wonderful, thanks to you, Mrs. Jamie. We could tell from the first visit you take care of your pups in a clean and caring environment. Thank you for all your help through the entire process. We are so glad we chose A&Js LoveOurPups! 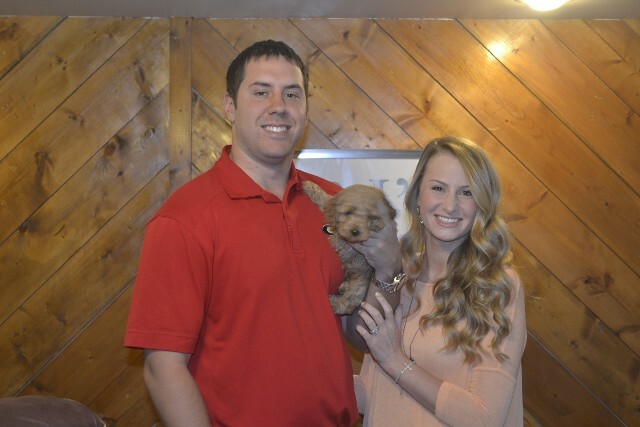 We thoroughly enjoyed our experience with you and A&J LoveOurPups! 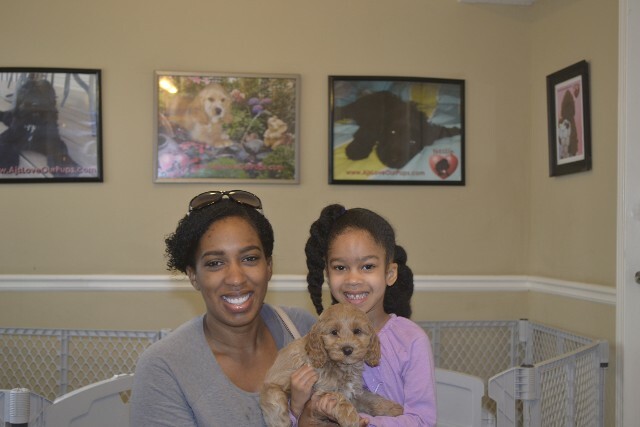 Although this was our second Cockapoo purchase, it was our first experience with A&J's and we found the home environment to be very loving, warm and friendly. We were very impressed with the overall care of the dogs. 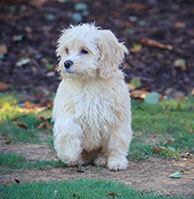 We enjoy the Cockapoo breed for their size, temperament and non-shedding coat. This breed just seems to fit with our family. 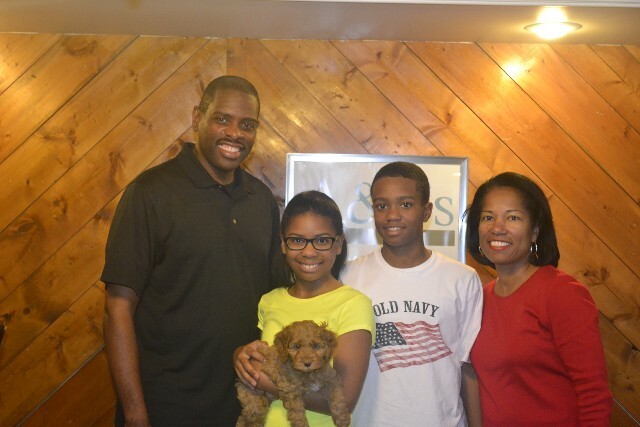 We appreciate all you did to make our adoption a smooth process and we have already recommended you to others! A giant thank you for bringing "Cooper" into our lives. He has only been home since Saturday, but the entire family is over the moon in love with him! I was expecting multiple sleepless nights, but thanks to you already transitioning him to a crate, he doesn't even whine at night! He woke us once the first night and since then has slept till at least 5 or 6.
kept in your home, and even off your bedroom at night, so changing to our home wasn't a shock to him. When we came out to meet the puppies you didn't rush us at all. I think my kids could have stayed all day, and you just might have let us! When we came back on adoption day, our packet was so well organized and informative, knowing I could go back to you with questions eased my own anxieties. And the homemade popcorn was delish. 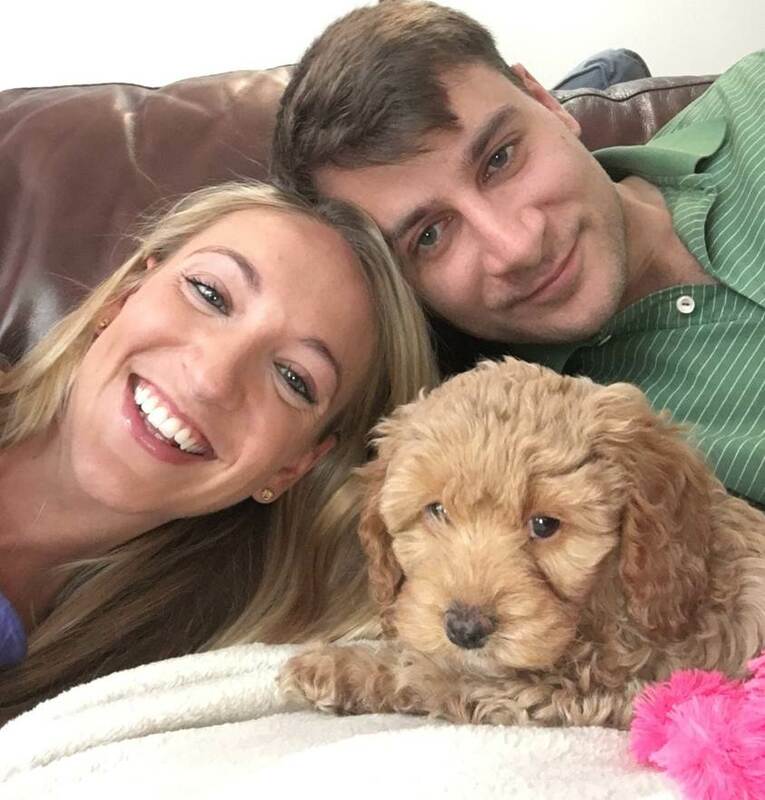 We loved our experience adopting our Cockapoo from A&J’s. After searching for a long time, we were so happy to find Jamie and just loved her puppies. The entire experience was absolutely perfect. Jamie answered all our questions and also let us see the Mom and Dad. The Cockapoo Puppies were clean, happy, and very healthy. We adopted Bo at 8 weeks and he is now thriving in our home. We would recommend A&J’s Love Our Pups to anyone interested. 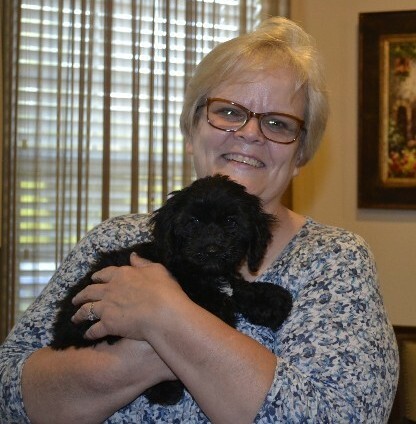 When we first started looking for a cockapoo puppy, we looled at puppies on the websites of more expensive breeders in the Georgia area. We were initially attracted to A&J's website because it appeared to be much more personable, and the prices were definitely more reasonable, and there was a lot of information about the adult doges and their puppies. 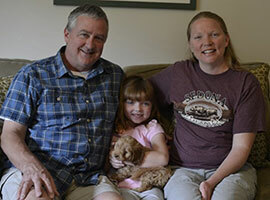 When we arrived at A&J's , we were extremely impressed by the clean, warm, home environment in which A&J's was birthing and caring for its adult dogs as well as the puppies. This certainly eased any anxiety we had about purchasing a puppy from a breeder because we knew our puppies were born and cared for the same type of family home environment we were going to provide. Jamie, A&J’S breeder, was very professional and courteous while showing us the puppies that were available, their mom and dad, and the living areas of all the dogs. All the adult dogs and puppies were just as beautiful, happy, and well groomed as they appeared on the website and they were all being raised by the breeder as part of the family. It was a hard decision, but we selected a little girl puppy, who we named Nyla. We were provided us with a great deal of information about how to care for Nyla, including a list of supplies to purchase and a daily schedule to follow. After following the instructions from A&J’s and, also attributable to the fact that Nyla was already used to being in a home environment, she adjusted very well on her very first night with us. As a matter of fact, we were so impressed and at ease with getting a puppy from A&J’S that we went back the next day and got a second puppy, a little boy, who we named Neko. As instructed by A&J’S, we took Nyla and Neko to the veterinarian for a check-up within 72 hours. Nyla and Neko are both healthy and happy puppies and have immediately adjusted to our family and being in our home. Having puppies is a big responsibility, but getting Nyla and Neko a highly reputable breeder such as A&J’S, has given us a good head start. Thanks so much A&J’S!